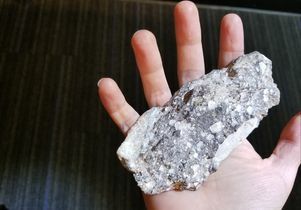 This rare lunar meteorite is on display at the UCLA Meteorite Gallery. The UCLA Meteorite Gallery has acquired a rare lunar meteorite that was blasted off the moon by the impact of a large meteoroid. 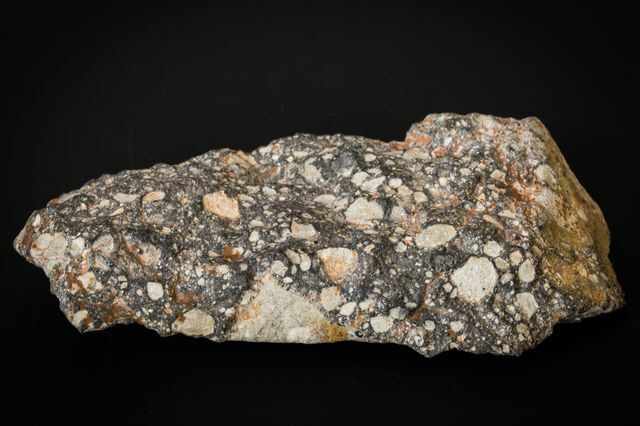 Named “La’gad,” the 185-gram meteorite eventually made its way to the Earth, landing in North Africa’s western Sahara Desert; it was recovered in 2015. “This lunar meteorite is probably the most spectacular lunar meteorite in a museum anywhere in the world,” said John Wasson, the gallery’s curator and a professor of geochemistry and chemistry in the UCLA College. UCLA scientists used a small chip from the specimen to measure the composition of its minerals, confirming its lunar origin, said UCLA researcher Paul Warren, an expert on lunar rocks. Lunar meteorites represent only about 0.5 percent of all meteorites discovered on Earth. 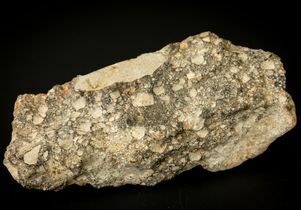 The meteorite contains larger angular fragments from the ancient, light-colored lunar highlands that make up 83 percent of the moon’s surface. These regions, which are pocked with craters, are composed mostly of a white aluminum and calcium-rich silicate mineral called anorthite. The effects of these impacts cause fragmentation, powdering and melting. The dark regions in La’gad are mixtures of crushed, powdered and melted material all produced during one or more impact events on the lunar surface. The meteorite contains an extraordinarily high density of large and diverse fragments, Warren said. 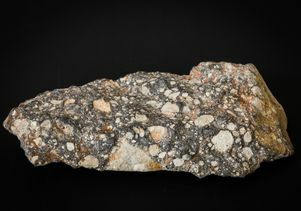 The La’gad lunar meteorite can be seen along with rare Martian meteorites and about 100 samples of various asteroids in UCLA’s Meteorite Gallery, which is located on the third floor of the Geology building in room 3697. The gallery is open to the public weekdays from 9 a.m. to 4 p.m. and Sundays from 1 to 4 p.m. On Sundays, volunteer docents staff the gallery. Admission is free. Lunar meteorites represent only about 0.5 percent of all meteorites discovered on Earth. Warren will present a free public lecture on “Meteorites from the Moon” on Sunday, Feb. 11 at 2:30 p.m. in the Geology building, room 3656, just down the hall from the gallery. The gallery displays the most beautiful specimens from California’s largest collection of meteorites. Meteorites are rocks ejected from asteroids, the moon and Mars that have traveled through interplanetary space and landed on Earth. They have information about the earliest history of the solar system that we cannot learn from the Earth itself, Wasson said. 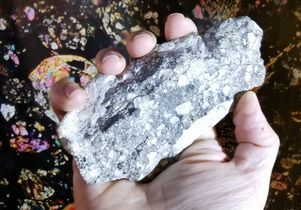 While the new lunar meteorite is small enough to be held in one hand, the gallery also contains large iron meteorites that can be touched by the public. 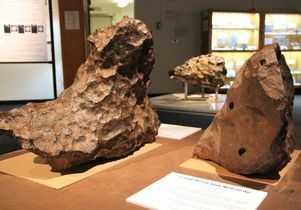 One of these meteorites weighs 811 pounds, and is displayed thanks to a long-term loan by UCLA alumnus Peter Utas and his wife, Barbara Broide. The gallery also displays a 357-pound chunk of the Canyon Diablo iron meteorite, part of a large asteroid that crashed into the Arizona desert 50,000 years ago. Another iron meteorite, also on loan from the Utas family, weighs 326 pounds and was found in Texas. The museum also features backlit samples of a class of beautiful meteorites called pallasites, which contain silicate minerals mixed with metal. UCLA’s Geology Building is located just southwest of the corner of Hilgard and Westholme avenues (map). See this rare lunar meteorite at the UCLA Meteorite Gallery. Admission is free. UCLA’s Meteorite Gallery has large iron meteorites, one weighing more than 800 pounds.